Because immigration law and our diverse clientele is so important to our firm, having a native Spanish speaking staff member is vital. Alejandra possesses these skills, and a lot more. A native of Bogotá Colombia, Alejandra has the important job to welcome and speak with any Spanish speaking callers who need our help. 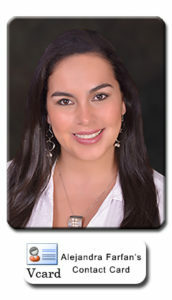 She answers phone calls for all Spanish speaking clients, interprets, and translates as needed for our office. She updates our Spanish websites and social media accounts, and coordinates with our office to meet the needs of our clients. Though not an attorney, Alejandra attended Santiago de Cali University School of law for three years, giving her an advanced understanding of legal concepts. She has always strived to advance herself, and she has also attended classes in International trade and business for two years. Alejandra is happily married with two beautiful children. She loves to go out on picnics and hiking with her family. She also has a passion for interior decorating. Her hope is to travel to exotic places and to learn about different cultures, law, language, and cuisine. She is completely self-motivated to learn, and in her down time, she enjoys spending time with her children, watching a movie, and having a bowl of popcorn. Intelligence, mastery of the Spanish language, experience, and her education in law school are just a few things that Alejandra brings to the table at Quiroga Law Office. In addition, her ambitious attitude, her infectious smile, and her willingness to work hard are the perfect attributes needed to succeed in our law firm.